Commanding respect from all quarters, we are ranked among the top names in the industry. 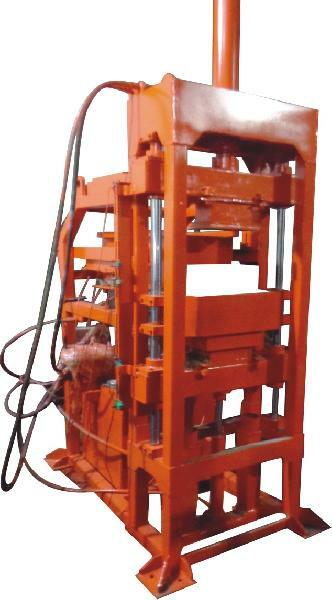 Automatic Interlocking Brick Making Machine on offer is available in a wide array of specifications designs and sizes. It is manufactured at our state of the art manufacturing facility making use of top notch raw materials, latest technology and advanced tools and equipment. Its optimum design, sturdy built and high efficiency are the traits which make the offer tempting. Heavy structure body with four nos. of shaft to guide the Ram Punch of Mould, Electric Panel (With Mitsubishi PLC), Hopper. Production Capacity 4500 to 6,000 Bricks/Shift. Not suitable for Hollow Blocks. Total Power - 12.5kw OR 16.5 H.P. Pan Mixer having capacity of 250 Kgs. complete with quality Worm Reduction Gear Box of Elecon/Roto-Reva powered by 5/7.5 H.P. Electric Motor. Belt Conveyor for loading and unloading material of the Pan Mixer , and powered by 2 H.P. Electric Motor with quality gear box with starter. No need of Wooden Pallets. Manual Lifting of Bricks.